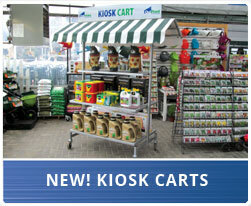 Turn a section of your parking lot into garden centre profits. OutFront Portable Solutions provides a turnkey approach that can add thousands of square feet of merchandising space, allowing retailers to optimize sales in new or expanded product categories. OutFront’s expertise in outdoor merchandising includes initial design and layout, fabrication and installation, making it easy to turn your strategic vision into a reality. Thanks to our expertise in portable systems, we can design and supply metal structures and fabric buildings for all purposes, including shade systems, lean-to’s, and mobile stages. Our XL SHELTER division provides pre-engineered industrial grade storage and protection solutions, for industry and agriculture.